Checking the skin regularly is an important part of any healthcare routine. In our practice we pay close attention to moles and other marks on the skin in a proactive approach to skin cancer, which as many as 1 in 5 American adults are at risk of developing. Living under the beautiful Southern California sun can increase that risk, as many local residents maintain an active outdoor lifestyle. In addition to guiding our patients on proper sun protection, we encourage yearly check-ups in our office where we can recognize the signs of the different types of skin cancer. The most common type of skin cancer is the non-melanoma type of basal cell carcinoma. This cancer tends to develop on areas of the skin that get the most sun exposure such as the hands, arms, face, neck, chest and shoulders, or even the legs and feet. Basal cell lesions often look like a pimple and may progress to look more like a scar or a shiny bump. These spots are usually painless but may bleed. Basal cell carcinoma, though not an aggressive type of this disease, should be removed with progression in size. Left untreated, a BCC lesion could affect the appearance of the body part on which it has formed and can eventually become destructive. Squamous cell carcinomas also typically form on sun-exposed skin, most commonly the scalp, ears, lip, face, neck, arms, hands and legs. These lesions may look like pink patches that are scaly or crusted and do not go away. As this carcinoma progresses, it tends to grow larger, forming a bump or sore that will not heal. As there are types of squamous cell skin cancer that are aggressive, and because this condition can be deadly, early detection and prompt treatment is advised. This is the most dangerous type of skin cancer which has the potential to be fatal, making early diagnosis and treatment crucial. Melanoma lesions can occur on any part of the body and can spread to any other part, including the brain and the lungs. People tend to associate melanoma with moles, but melanoma lesions can also occur on their own - appearing brown, black, or even skin-colored. 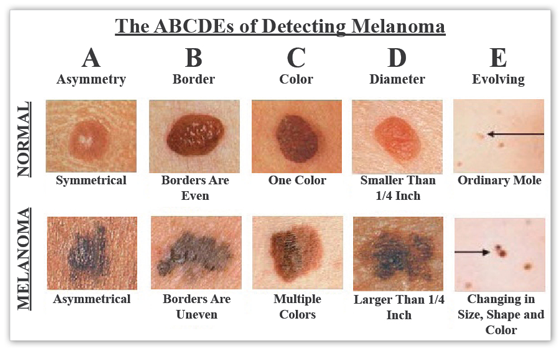 Melanoma skin cancer develops from the pigment cells in skin which mutate with certain triggers, like UV exposure. If you have a family member who has experienced this or any other type of skin cancer, regular skin checks with Dr. Farshidi are highly recommended for optimal health. To monitor skin health, we closely track moles for changes and detect new moles. Any form of skin cancer can seem like a frightening diagnosis. In reality this condition is very treatable with various approaches, most of which can take place in our office. We focus on detecting skin cancer early and devising the most effective treatment plan. Some lesions can be excised, while others may be referred to a Mohs specialist. Every patient has a specific set of needs which we meet through personalized care. Skin cancer is a condition that we can do our best to prevent. Though no one is expected to avoid time in the sun, adequate protection with a broad-spectrum sunscreen is necessary for ultimate skin health. Avoiding exposure to the sun during peak hours and avoiding tanning beds increases your chances of maintaining healthy, beautiful skin. Give your skin the attention it needs. Contact us to schedule your skin-health assessment.